sportsmatrix » Will Jesus give Barca the Blues? Undoubtedly one of the ties of the second round of the Champions League pits England’s Manchester City against Spanish giants Barcelona. 5 years ago this kind of fixture existed only in the dreams of the City supporters but thanks to the investment of the Abu Dhabi United Group, City have become one of the power houses of European football. One of the most exciting aspects surrounding this tie is the fact that both teams employ a very attack minded approach to their style of play. Both teams have already scored over 100 goals this season (although Barcelona’s total includes goals scored in friendly matches). Keeping in mind, how attack minded these teams are we decided to take an in-depth look where the two teams differ in the attacks and where the main battle may be. 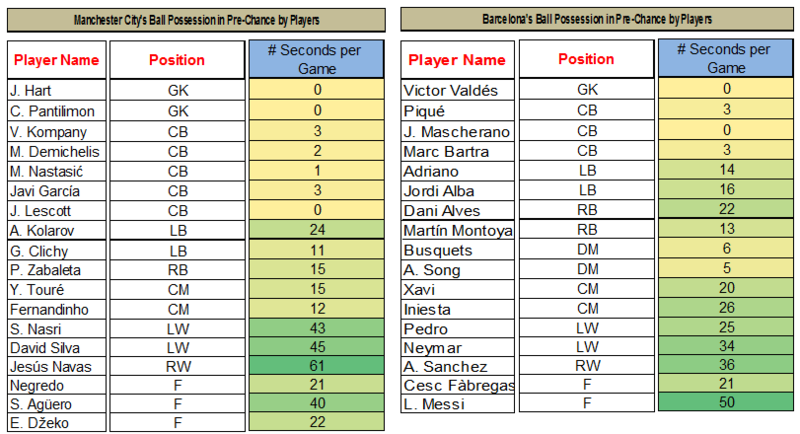 In the tables below, you will see the break down, by minutes, as to how each team spends its time on the ball. Whilst Barcelona spend more time, per game, with possession than City, the men from the Etihad do spend more time in a pre chance scenario than their Spanish counterparts. We have defined a pre chance scenario as a dangerous situation from where a chance on goal could be create. Interestingly, despite Barcelona having more possession, City make more of their possession than the Catalans, and thus spend more time in a pre chance and indeed a chance situation than Barcelona. Simply put, City are not concerned with the tiki taka that has become synonymous with Barca, and rather look to get the ball in a position from where they can get a shot on goal. As can be seen from the tables below, City prefer to attack from the right whereas Barcelona are more prone to attack down the middle. With this in mind, we looked at the players themselves to try determine which player, for both teams is the danger man when it comes to a pre chance scenario. As can be seen, the player who has the most possession of the ball in these situations is Jesus Navas and he is City’s target man when the team tries to get into a dangerous situation. Unsurprising, Barcelona’s danger man in these situations is Lionel Messi. So with the fact that Navas, who plays on the right, is the danger man for City, the question is how will Barcelona cope with this threat? This season so far, Tata Martino has rotated the left back position between Jordi Alba and Adriano. One of these players will be tasked with containing the attacking threat of Navas. In the tables below we have compared the two Barcelona men and how they deal with both medium risk and high risk situations. From the above it would seem that Jordi Alba would be the better option in dealing with Navas. 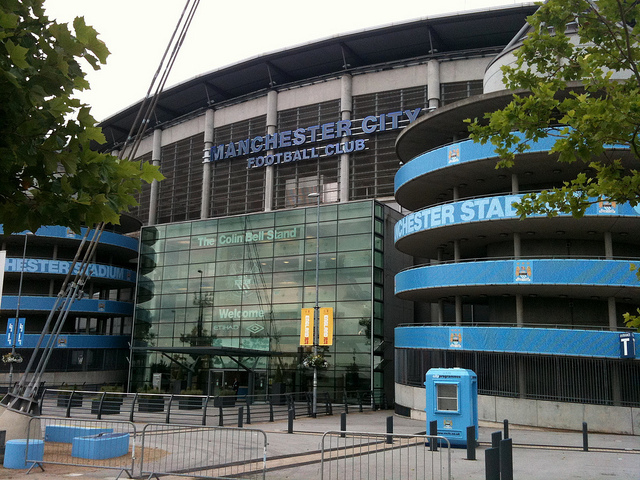 As the game is being played at the Etihad, there is no doubt that City will be trying to make home advantage count so that when they go to the Camp Nou for the return leg, they will have a lead to protect and a lot could hinge on this battle. « Who Is The Foulest Of Them All?